Pat Moncur and her daughter Savannah thank the crowd of volunteers and SECU employees. Pat and her daughter Savannah, a precocious and confident 8-year-old, have had enough scares already. Pat came to America as the new wife of an American serviceman. The marriage was brief, but she and Savannah persevered through life in homeless shelters and grubby rental homes. She recalls being swindled out of a $500 deposit by a former landlord, and places where fighting and fear were constants. And once she found a more suitable apartment she had to move when the landlord sold it. Life was constant turmoil and uncertainty. In her most desperate times, Pat worked three jobs simultaneously, determined to get her daughter away from ugliness and into this place she now calls home – her newly renovated house in a quiet and pretty neighborhood. She can go off to her jobs now – just two; full-time as a teller at Wells Fargo bank and weekends at a TJ Maxx department store. 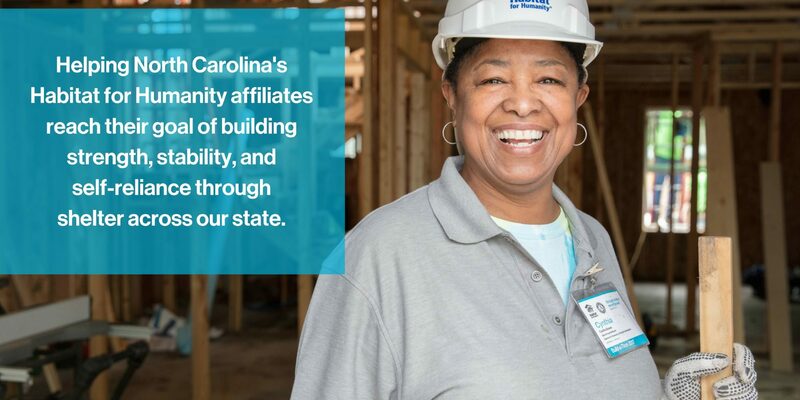 Pat’s house is one of 100 being built across North Carolina – one in each of the state’s 100 counties – as part of the State Employees Credit Union Foundation’sMountains-to-the-Sea Challenge. The SECU Foundation has put up $10 million for the challenge. As soon as a homeowner assumes a zero-percent-interest SECU mortgage, the Foundation returns the funds to the Habitat affiliate so that another home can be built. The foundation is funded with the $1 per month maintenance fee donated by each member. With representatives of the local SECU offices, Pat and Savannah Moncur lead a fist-pump of appreciation. In the back yard of their new home, Pat and Savannah Moncur, center front, stand with some of the people who helped to secure her future. At left is Greg Kirkpatrick, CEO of Habitat for Humanity North Carolina. The house cost more than many Habitat homes because the price of island real estate, but lots of volunteer hours for its renovation made it affordable.